Nick a university graduate recovering from a humiliating breakup is reluctantly dragged to a music festival by his loyal best friend. Unfortunately the hapless pair soon lurch from one disaster to the next as they experience the very best and worst the mud drenched madness of a music festival has to offer. Director Ian Morris delivers yet another riotously funny character assassination of adolescent shamefulness. While showcasing his proven flare for turning bodily functions and social ineptness into calamitous comedy gold, The Festival also serves as a fitting homage to the messy reality of music festivals. Many of the discomforts and misfortunes Nick and his well-intentioned friends endure will be embarrassingly familiar to anyone who’s ever popped a tent at a real life festival. Given the combination of Morris and former cast members, it’s impossible to avoid inevitable comparisons with The Inbetweeners. While the tone and comedic tactics are undoubtedly similar it’s a compliment to the filmmaking talents that this never feels like merely an awkward attempt to recapture former glories. A host of new characters and a highly specific setting gives the film more than enough distinct personality. This film never feels like an attempt to make The Inbetweeners 3, even if it will absolutely satisfy the many fans who yearned for more of their signature comedy style. Leading man Joe Thomas is an actor with a unique combination of endearing likeability and obnoxious cluelessness. It allows audiences to simultaneously sympathise with his character’s disastrous misfortunes and yet also joyously revel in them. It’s a comedic gift he’s employed repeatedly in The Inbetweeners or Fresh Meat and it transfers effortlessly once again to the big screen. The Festival provides the perfect vehicle for his indignant frustration and dejected disappointment, throwing a barrage of increasingly extreme calamity against him. Thomas as always eagerly shows willingness to sacrifice both body and pride for audiences’ entertainment. Special praise is also due to Hammed Animashaun and Claudia O’Doherty as Nick’s abundantly optimistic friends. Their characters help constantly propel the film in more absurd directions, adding even more fuel to Nick’s raging fire of shame and abject failure. Their endearing enthusiasm for situations and each other in the face of disaster helps keep the audience on their side even when Nick’s selfishly self-defeating antics test the limits of that sympathy. Around the film’s hapless trio of heroes a line-up of familiar faces do a great job providing comedic support, with the likes of Jermain Clement, Nick Frost and Noel Fielding among them. It’s also worth noting that filming at real life festivals gives the film a sense of genuine scale far beyond the film’s relatively modest budget. It’s a clever way of making sure the film captures a credible sense of the ‘epic insanity’ of an actual music festival. Anyone who found The Inbetweeners trademark cringe drenched comedy exploits to be more excruciating than entertaining will likely have a similarly visceral reaction to The Festival. Not everyone seemingly finds joy so easily in witnessing the chronic failures and inevitable humiliations of hapless young adults. Those that can’t bare the sight of tortuous embarrassment will likely spend much of the film squirming with discomfort. So be warned that this is clearly and unashamedly a film for those that actually relish those feelings. 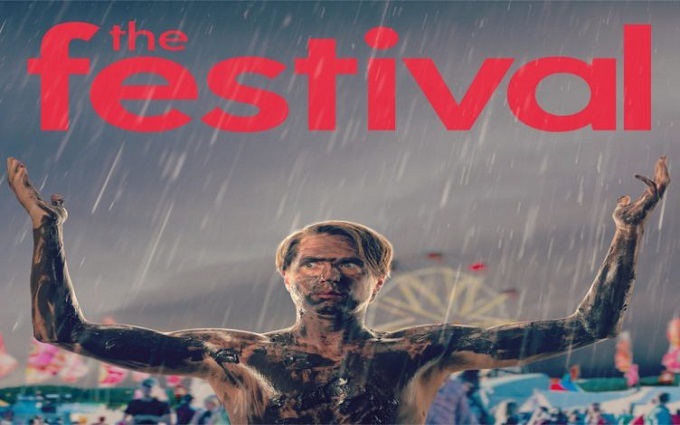 The Festival is a five star slice of cringe soaked comedy that perfectly captures the shameful mud drenched misadventures and madness of music festivals. Likeable leads and an enthusiastic supporting cast sacrifice dignity for a steady stream of memorable laugh out loud moments. Fans of The Inbetweeners in particular will find plenty of familiar joys and some new delights in their festival experience.